BERKELEY — “Facing Two Directions: A Japanese Painter Looks to China” is on view at the Berkeley Art Museum/Pacific Film Archive through May 19. 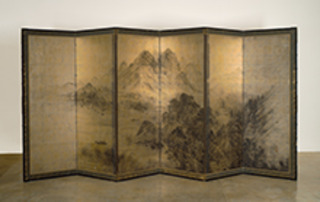 Sakaki Hyakusen: Landscape, 18th century; pair of six-fold screens (detail); ink on gold and silver; 66¾ × 143⅜ in. each; gift of James Cahill. A magnificent pair of screens painted in ink on an unusual background of silver and gold by Sakaki Hyakusen (1697–1752), the founding father of Nanga (Southern School) painting in Japan, presents a shimmering vision of a watery landscape. The screens display elements that are unusual at this early point in Nanga painting—precise brushwork, detailed treatment of foreground elements, and the incorporation of spatial effects to produce atmosphere — revealing Hyakusen’s surprising mastery of Chinese painting technique. James Cahill, UC Berkeley professor emeritus, describes Hyakusen as an artist facing two directions: one toward the celebrated past of Ming and early Qing dynasty Chinese painting, and the other toward the future through his influence on succeeding generations of Nanga painters such as Yosa Buson (1716–83), whose screen “Landscape with Travelers” is also on view. Hyakusen appears to be anomalous in his ability to distinctly interpret Chinese painting traditions with great subtlety and skill. Most Nanga artists learned their techniques and painterly style not from original Chinese artworks but from woodblock-printed manuals that were imported into a very insular Japan. The varied brushwork and the complex compositional techniques evident in these screens suggest that Hyakusen had first-hand knowledge of genuine works of art from China, which he perhaps saw in the open port of Nagasaki. The screens, a recent gift to BAM/PFA, are approximately 250 years old and yet they remain fresh and exhilarating. Still, they show their age, including grime and oxidation of the painted surface, as well as some damage to the mounting and backing. BAM/PFA is actively pursuing funding for the conservation of these important works of art to secure their preservation for future generations. “Facing Two Directions” is co-organized by Cahill and Senior Curator for Asian Art Julia M. White. BAM gallery entrances are at 2626 Bancroft Way and 2621 Durant Ave, between College and Telegraph. Hours: Wednesday through Sunday, 11 a.m. to 5 p.m.; open selected Fridays until 9 p.m. Admission: Free for BAM/PFA members, UC Berkeley students, faculty, staff and retirees, and children 12 and under; $10 for adults (18-64); $7 for non-UC Berkeley students, senior citizens (65 and over), disabled persons, and young adults (13-17). Free admission to the galleries on the first Thursday of every month. For more information, including directions and parking, visit www.bampfa.berkeley.edu.